On April 9th, 1865 the United States Civil War came to an end. Now, over 150 years later, these events have inspired an all-black punk rock band known as The 1865. Describing themselves as “Bad Brains meets Foo Fighters in a black woman’s hair salon for a cup of tea,” the Brooklyn-based band is in a class all their own. With the release of their debut album, Don’t Tread on We, The 1865 explore life in America following the Civil War—a land living in the shadows of the fallen Confederacy. Don’t Tread on We is a powerful album in both message and musicality, speaking on issues that have persisted throughout U.S. history. This entry was posted in Popular, Rock, and Misc. 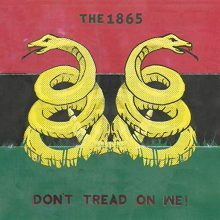 and tagged CD review, Don't Tread On We, Jared Griffin, Mass Appeal, rock, The 1865 by aaamc. Bookmark the permalink.